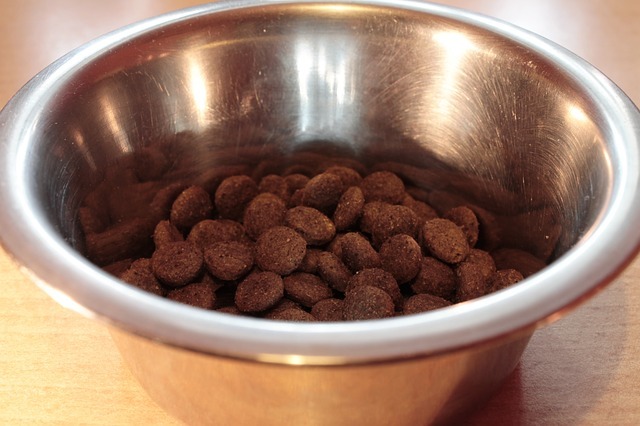 A dog balanced diet is essential to keep your dog looking and feeling wonderful. Your puppy/dog must have the right amount of carbohydrates, fats, minerals, proteins and water in correct proportions to maintain a healthy body. With so many dog food companies making a variety of foods for all stages of life it can be hard to know what is just right for your pet. One way you can know if the food you are feeding your pet is right for him is by observing if your pets energy level is right, if his stools are brown and firm and if his coat and skin are healthy looking. You can check with the breeder you got your puppy from and ask what they feed their dogs and you can ask your vet for advice. Puppies need more nutrients and calories than adult dogs do. Most breeders leave their puppies on a quality puppy food for its first year. They will start out with moist food, after a week they will add kibbles to it and eventually switch over to the dry kibbles. Biting hard kibbles is great for keeping your dog’s teeth clean. Your pet has different nutritional needs than you do so do not get coaxed into feeding him your food. It isn’t good for your pet. Dogs need a separate food dish and water dish. Their bowls need to be cleaned everyday and fresh water should always be available. Dog bones like ‘marrow bones’ and ‘knuckle bones’ are great for your puppy to chew on especially when teething. Amazon.com’s best selling dog food is Taste of the Wild High Prairie Puppy Formula with Bison and Roasted Venison Dry Dog Food, 30-Pound Bag . It’s made with real roasted bison and venison meats, fruits, and vegetables. They also carry other types including lamb, salmon, and wildfowl. Bags are shipped in 5 pound, 15 pound, and 30 pound sizes. My dog loves those Meaty Knuckle Bones. They come in a variety of sizes and types. She particularly loves the mammoth bone. They are fairly inexpensive, and you don’t have to worry about your dog choking on rawhide pieces. I do most of my shopping online, and I found that petsmart usually has better deals than petco (note: I said usually, not always). They have those meaty bones on their website (regular price), at the same price petco has them on their site (SALE price). Walmart also has them for about the same price as petsmart.